One small step for mankind, One cool poster for college dorm life. This First Steps On The Moon - Poster makes a great dorm room decoration for college students who want wall decor with a certain vibe. This black and white poster of astronauts on the moon relives the space race of the 60's. The space age was a pinnacle of american invention and discovery. This cool poster capsules some of that ingenuity that outpaced the Soviet Space Program. Although only a few people have set foot on the moon, this inspirational poster will encourage you to reach for your goals (even if you too want to walk on the moon!). Show your unique dorm room off to all your college friends with this equally unique poster. 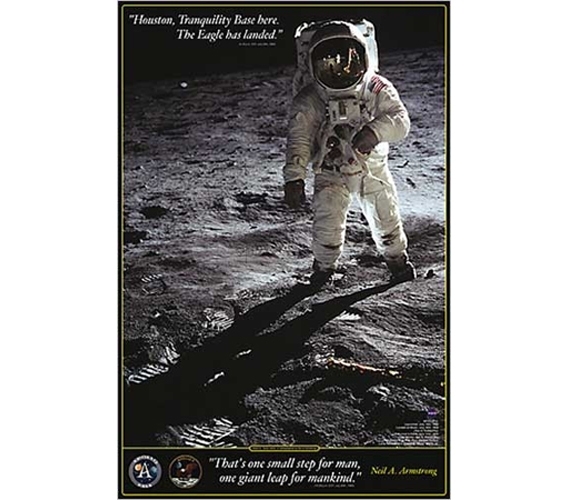 Have a friend that is impossible to shop for, you won't stray from orbit with the First Steps Moon Poster.